We are delighted to announce the promotion of Suzanne Zens to the position of Director of Sales of KDI Elements. 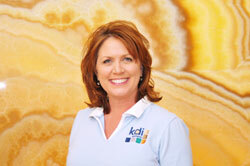 Suzanne joined KDI two years ago as a design consultant after 17 years in the industry. In this new position, Suzanne will be in charge of the Sales Department and will be responsible for oversight of the sales staff, the showroom design and content, client development and existing customer and trade relationships.